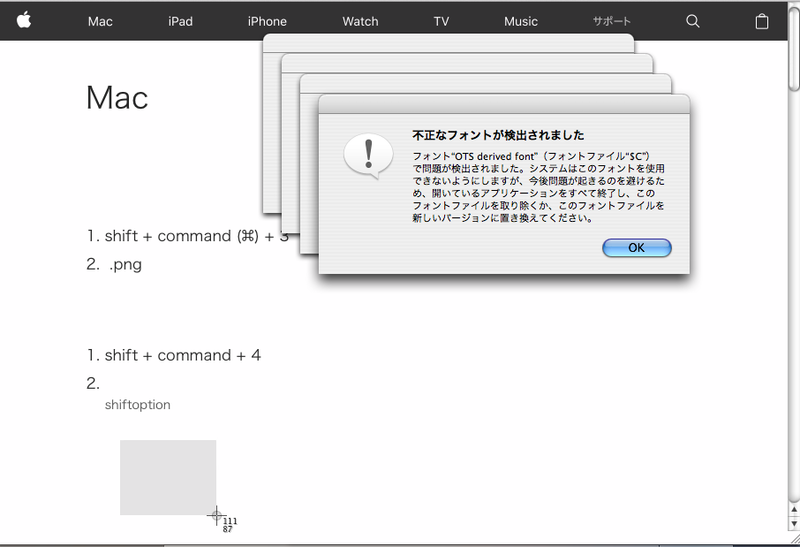 "Bad font detected"(translated from Japanese to English, because my machine is in Japanese) popped up. All Japanese characters disappear, remaining some words in Latin alphabets. Clicking "Inspect element" in context menu, and I searched about font, I've found sentence included Japanese font like this. 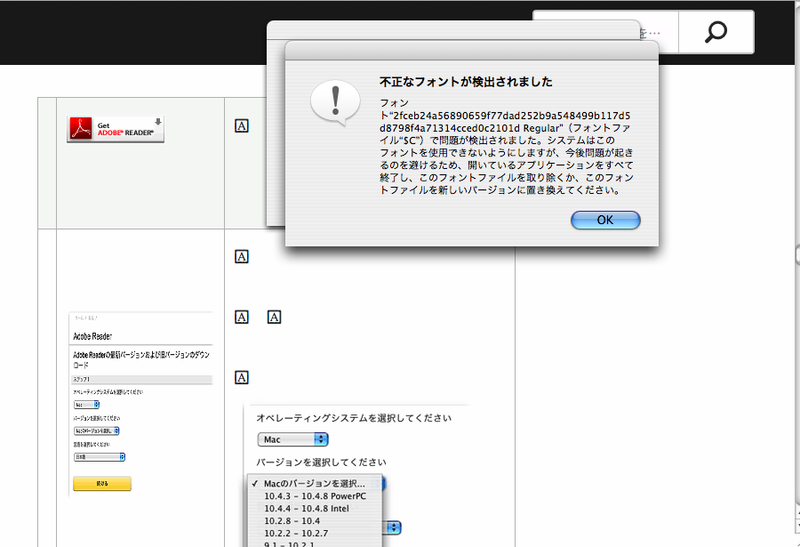 Similar phenomenon occurs in Adobe site "https://helpx.adobe.com/jp/acrobat/kb/2463.html". I've found this line in a site source. Thank you for the detailed report. Certain webfonts are known to be incompatible with 10.4 and 10.5. Unfortunately, due to other limitations, it is not possible to detect them automatically. We maintain a blacklist of bad fonts, and the browser will select an alternative with the same character. Using the steps in this earlier support ticket, are you able to find the font URL that causes the problem for you? I can make a guess from the Apple URL, but not the Adobe one. If you can provide both, I will add them to the internal blacklist for the next release of TenFourFox. My 10.5 shows no message box but the text also disappears. Workaround: Press Esc in time. I'll follow your instruction tomorrow, because I need to go out today. I have followed your instructions, these URL I found. I can't find any URL Box of defective fonts on Adobe site. But 2 fonts didn't appear "Abc"s, and these fonts are below. If there is a shortage of information, please let me know. The Apple URLs will be blocked. Thank you for performing those steps. I have found another bad fonts error on google calendar. Same situation in previous case. Latin alphabets display correctly, only Japanese characters disappear. Would you mind considering putting these fonts in blacklist? The number of font URLs is large this time though, I write down below, just in case. 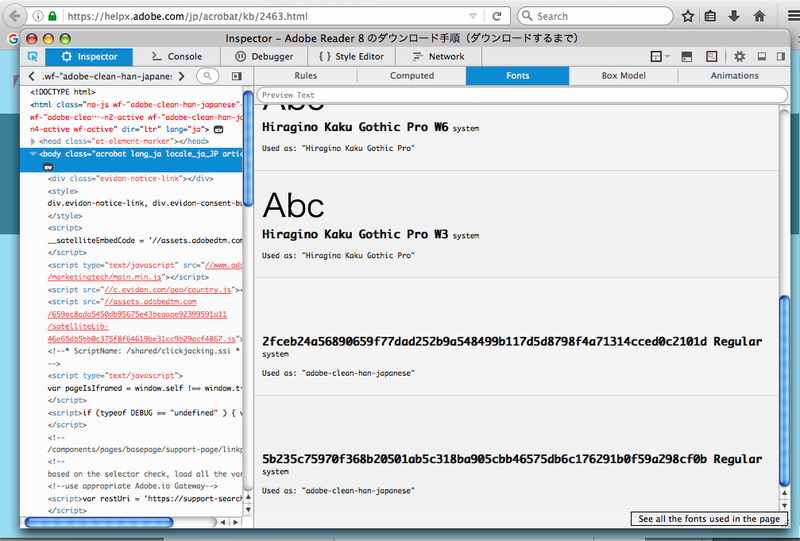 (MISSING NAME) remote, Used as: "Noto Sans JP" in inspector window. Yes, those can be added. We have a way of blocking entire font family URLs by pattern. I understand those fonts can be handled systematically. Please add those fonts in blacklist. I hope it'll fix the problem! This issue has been fixed internally and will be available in the next beta, which should be out in a week or two. And once again, I'd like to say thank you for your constant effort to develop this wonderful application. Tenfourfox keeps our PowerPC world and my Mac alive. After downloading TFF FPR 9 beta 1, I confirmed that I was able to read three sites (Apple, Adobe, Google Calendar) without a problem. I will close this ticket as fixed. No reply is needed. Any reply you make will reopen the ticket. Cameron Kaiser closed this discussion on 31 Jul, 2018 02:23 PM.